Need A Visa to Travel? What Is That? What is visa? Where do you get one and where does it go? Did you think that all you needed to travel was your passport? Sometimes that is all you need, but some countries also require a visa, so let's take a look at them. Visas go in all those blank pages in your passport. I'm assuming you've read the pages on passports, and you've got your passport or you'll soon have one. I mean, come on, you need one just for bragging rights. OK, Now Just What Is A Visa? No, it's not that piece of plastic that you carry in your wallet. Although I do recall one time entering Nairobi, Kenya and seeing a sign directing tourists to the proper office... the sign came straight from an advertisement for that very same credit card! O.K. Let's get serious. A visa is permission from the country you are going to visit to enter their country. We'll review some of the basics at the top, and get to questions you may have to answer at the bottom. Many countries do not require a visa for entry if you are only going to visit on vacation for less than 30 or 90 days. They will look at your passport when you enter the country, probably scan it into a computer, and they may or may not place an entry stamp in your passport. For example, American citizens can travel to most countries in the European Union, Canada, Mexico and some South American and Asian counties without a visa. Some countries require a visa, but it can be obtained at entry. This requires you to fill out paperwork on arrival. It may require passport size photos and a fee payable at application. You should check ahead to see how many photos may be required for each country and how you can pay for it. For instance when we went to Cambodia a couple of years ago, the requirement was one passport size photo and US$20.00 cash.... no matter what country you came from, it had to be US dollars. You will need two 2" x 2" photos for your passport application anyway. Get extras in case you need them for visas.... 6-12 so if you need some you will have them on hand. Though as we keep saying, we hope you've got your passport tucked safely in your money belt and you will never need to use them for this! Just remember that they should be "current" photos, so you can't save and use them forever. Some countries require you to obtain a visa stamp in your passport BEFORE your departure. This is not difficult. To do this you must obtain an application.... either by contacting the Consulate, United Nations Mission, or Embassy of that country and having them mail you one or by downloading an application off of the web. Check with your government's website for information. U.S. citizens can check at the U.S. Department of State site. Their Learn About Your Destination section lets you look up the country or countries you will be going to. Look for their Foreign Entry Requirements. The State Department site also has links to Consulates and Embassies. This site gives you general information on what is required if you are traveling for tourism, but check the link to the country anyway... for instance, the State Department site tells you most of the information you need, but you'll have to check with the Chinese Embassy to find out that China requires your passport to be valid for six (6) months and at least one full blank page. Why worry about blank pages? There seem to be a lot of blank ones when you start. But if you really get into it and travel a lot, you may collect a lot of large stamps and have to add pages to your passport as we just did. Once you have collected all the documentation you need, you will then have to carry your passport, application, photos and fee to one of those entities if you live near one, or you will have to mail your passport with the application, fee and photos to them. Each country has it's own rules and requirements, check on the web or with an official representative to get the appropriate information. You will probably have to provide return postage. Some Consulates will mail your passport back to you, some won't. If you have to use the mail or an express delivery service it will take longer. If you have to use the mail... Just remember to send your passport as securely as possible. If you are visiting more than one country that requires a visa, it could take you a few weeks to get everything arranged... you and your passport can only be in one place at a time. Remember that some counties require that your passport be valid for at least 6 months after the end of your visit.... so if it is getting near to the expiration date on your passport, you might just want to go ahead and renew. Requirements may change from time to time, so even if you think you know what the requirement are because you checked years ago.... check again. You don't want to ruin a trip because you didn't get the visa! Let's just say you want to go to Timbuktu... yes, there IS a Timbuktu. It's in Mali in West Africa. Check out the entry requirements for every adventurer's fantasy destination. Now... Let me repeat myself. To find out what the procedure is for each country you want to visit, check with the Embassy of that country. You can look up basic information on the US State Department site, but the ultimate requirements are defined by each country, and it's best to check with them. Does your passport need to be valid for 3 or 6 months after your visit ends? Can you pay with a credit card? A cashier's check? A personal check? Cash? Do you need a letter or "invitation" from a travel agency? Do you need proof of a hotel reservation? Single entry or multiple entry.... you may think it's only one trip, but if you pass through a county more than once in visiting multiple counties in a region, you may need a multiple entry visa... which will almost always cost you more, but is worth it not having to work that out once you're on the road. This may not be a complete list, but these are some of the questions we have come across in our travels. There are service companies that will get visas for you for a fee. You still need to allow plenty of time. If you are using a travel agent they may be able to advise and assist you. Remember to protect your passport on the road.... Wear your money belt... put the passport in it when you won't be using it. Another good tip is to wrap the passport and money in a water tight zip lock bag. 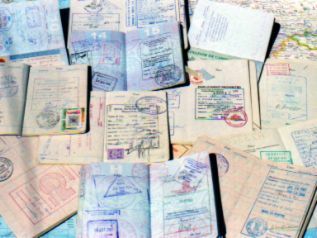 Keep a photo copy of your passport in a more accessible place you may be able to show when asked; that may be enough, but you can always dig out your passport if you have to. So get going. Get your passport, collect those visas, pack and get on the road.